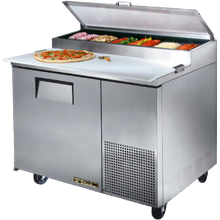 An essential piece for foodservice operations producing sandwiches, salads, pizzas and other made-to-order dishes is food prep refrigeration. 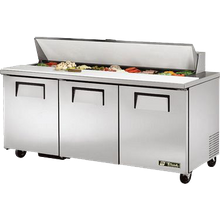 Food prep refrigerators combine refrigeration and storage together for easy prepping of food in one convenient piece of equipment. Choose from one- to four-door units with varying door sizes and cut-outs for various food pan configurations. Available with doors, drawers or a combination of both, choose the configuration that best fits your operation’s needs.